Let's face it, B2B leads are the lifeblood of your business. But generating more quality B2B leads in a world of self-educating buyers needs a system. You need a process for building trust online as well as getting found in the first place! Getting found is half the battle. You can't generate a lead if they can't find you, so you should first focus on the activities that are going to get people to your site. 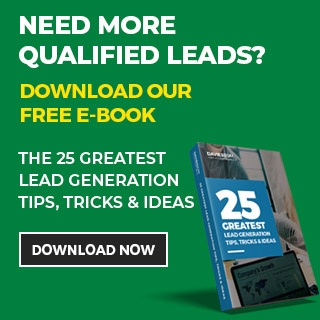 Here are 7 ways you can get more B2B leads from your website. Making sure your website is optimised for the keywords you want to rank for is a critical first step. If you're using Wordpress or your own domain, you're in luck. Optimising your website is easy using free plugins such as All in One SEO, and SEO by Yoast. Blog? I don't have time to blog! The fact is, you can't afford not to. Every blog is a searchable page, which means the more blogs you have the more searchable pages you have on Google. By first determining the keywords or terms that people are searching for, you can better your chances of ranking well (first page) and drawing traffic to your site. Here's a few terms that we rank for, which draws tonnes of traffic and potential leads to our Davies BDM site every day. What is Strategic Marketing and Team Strategy Day Success. Sharing content offers, your blogs, links to your newsletter and other web content on LinkedIn, Facebook, Instagram, and Twitter is a critical way to increase traffic from new prospects. It's also a great way of staying front of mind with your current database. Your prospects can't start a relationship with you if you don't provide a way to allow them to connect with you. Web forms are a critical part of the process - they're the plumbing that allows you to convert a visitor to a lead. There are plenty of affordable form tools that allow you to do this, like Hubspot Marketing Free. Content Marketing and Inbound Marketing are terms you've no doubt heard. Offering content that is valuable to your target prospects is a central feature of generating a lead - getting someone to give you their email address. A Call To Action (or CTA) is just that. CTAs entice the prospect to engage, often in return for a free offer of something valuable that the prospect can download. In return for the offer, you receive the prospect's email address and a visitor instantly becomes a lead. Calls To Action by themselves do only half the job of capturing a lead. Once a CTA is clicked on you need a place where your prospects can submit their details in return for your valuable offer. Landing pages serve this crucial purpose. They are the place you 'land' once you've clicked on the CTA. This is the place your prospects give you their details and turn from a visitor to a lead. OK it's here at #7 on the list, but creating buyer personas should be the first thing you do to attract visitors to your site. Getting quality leads is only going to happen if your web content is optimised and developed so that it's attractive to your prospects. Defining your buyer personas and then developing their buyer journeys - from first being aware they have a problem through to their decision to buy - is critical in making it all work. Having content that doesn't resonate and solve the problems of the people you're trying to help is a surefire way of building a website and digital strategy that doesn't work. Remember, by attracting the right traffic to your website, and employing a rock solid strategy to engage that traffic, you will be able to build a database of potential clients and gain more B2B leads. Without this strategy, not only will you jeopardise the amount of traffic you draw, you'll compromise the quality of that traffic. You want visitors to your site that are looking specifically for your service, not those who have been led astray. Good SEO and social media presence generates the right traffic, and good website design and engagement strategies maximise the percentage of that traffic which will convert to leads.